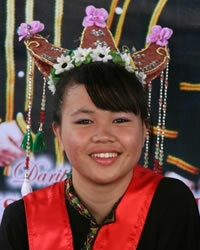 The Bisaya peoples comprise several distinct people groups related by name and to a lesser extent language. The most populous group are the Bisaya-Tutong, who originated from Sabah and also Brunei along the banks of the Limbang River south of Tutong and into the northern part of Sarawak, East Malaysia. More specifically, they come from Brunei, and the neighboring Malaysian states of Sarawak and Sabah. The Bisaya people groups speak languages which are classified as Bisaya, a subgroup of the Dusunic family of languages. It is said that most of the Bisaya converted to Islam many years ago. Yet many animistic customs linger. In their homeland villages, they still hold occasional ceremonies to appease the spirits of the dead that are believed to be associated with a collection of skulls from their headhunting days. Many people in North America mistakenly identify them as Malay people. Most of the Bisaya have never had an opportunity to hear the good news. Pray that the good news and other study materials will be translated into their language so they can fully understand God's truth.